The title of my column is a nickname actors and directors have applied to us stuntmen. They oftentimes call us Action Actors, because we act out the action for the actor we are doubling or do the stunt in the scene the director is currently shooting. It’s my privilege to write about one of the best action actors ever to pad up. Bill Catching’s credits resume runs for pages. Bill started as one of the horse wranglers on “The Durango Kid” at Columbia. Well respected as a horse trainer, it was only natural he’d move into the stunt field. In the late ‘40s, when Bill was making his mark, westerns on the big screen and the new medium of television were the dominant product. Bill was involved with TV westerns from the get-go as the double for Leo Carrillo on the popular “Cisco Kid” series at ZIV. Heavily padded up to resemble Carrillo, Bill has stated he loved working with Leo and Duncan Renaldo. Bill also worked on ZIV’s detective series, “Boston Blackie” with Kent Taylor. With so many shows filming in early TV (they usually shot 39 episodes a season then), Bill quickly worked his way up to being a stunt coordinator and second unit director on “Kit Carson”, “Wild Bill Hickok”, “Hondo”, “The Untouchables”, “Big Valley”, “Wild Wild West”, “The Name of the Game”, “Most Wanted”, “Gunsmoke”, “The Rebel”, “Wyatt Earp”, “Rawhide” and “The Roy Rogers Show” on which he doubled for Roy. When the title and responsibility of second unit director (he directs most of the action scenes) is bestowed upon an individual, it signifies he’s reached the pinnacle of success in the stunt field. The second unit director goes off from the main unit with a camera crew, the stunt doubles and assorted stuntpeople required to film all the action needed for that film or TV series. To see Bill’s expertise at coordinating and second unit directing, watch “The Fall Guy” reruns. You’ll marvel at the action put on film by Bill and the stunt crew. I was fortunate to have worked on that series for three years with Bill at the helm. It was hard work and long hours but the stuntmen would do it all over again for the chance to work with Bill Catching. Run “The Cowboys” on your VCR, watch the tremendous fight between John Wayne and Bruce Dern. It’s Bill doing most of the fight for Dern. In “Sergeants 3” with Frank Sinatra it’s Bill doubling for Peter Lawford throughout. Bill is an exceptional man, a very innovative director, a courageous individual and a daring athlete. You cannot lie to a motion picture camera, Bill Catching delivered the goods every time he performed. After a four decade career of thrilling audiences and making actors look good, Bill spent a well deserved retirement on his ranch just outside of Yuma where he raised prize horses. In August 1994 he received a Golden Boot Award for excellence in western films. 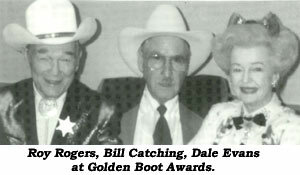 His dear friend, the King of the Cowboys, Roy Rogers, presented Bill with his Golden Boot. In addition to Neil’s appreciation of Catching, we will add: J. P. “Bill” Catching hitchhiked from Bandera, TX, to Hollywood in ‘42 when he was 16. He went to work in barns that furnished horses to movies. After Navy service in WWII, Bill worked as a wrangler for Ralph McCutcheon, who furnished livestock to Columbia. Upon urging from Al Wyatt and Jock Mahoney, Bill and Troy Melton signed on as stuntmen at ZIV, an early giant in TV production. As Neil said, Catching worked on “Cisco Kid” and “Boston Blackie” at ZIV as well as over 500 episodes of “Highway Patrol”, “I Led Three Lives”, “Bat Masterson”, “Tombstone Territory”, “Rough Riders” and others over a five year span. 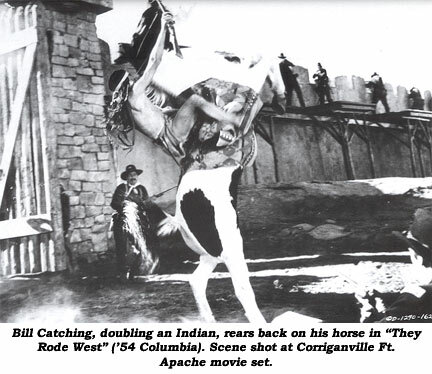 Leaving ZIV in ‘53, he went to Columbia where his first stunt coordinating job was on “They Rode West”. While at Columbia Bill worked with George Montgomery, Phil Carey, Gene Autry and on TV’s “Rin Tin Tin”. He worked for awhile on “Wild Bill Hickok” as Neil stated then on to “Roy Rogers” and “Brave Eagle”. Other western series Bill worked on, in addition to those documented by Neil: “Wyatt Earp”, “Range Rider”, “Gunsmoke”, “Wagon Train”, “Bonanza”, “Texas John Slaughter”, “Andy Burnett”, “Zane Grey Theatre”, “Bronco”, “Tales of Wells Fargo”, “Elfego Baca”, “Lawman”, “Maverick”, “Loner”, “Laramie”, “Virginian” and “Rawhide”. 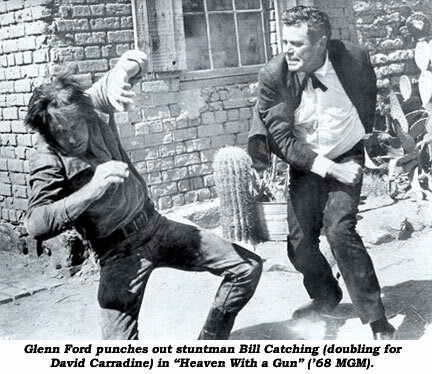 The veteran stuntman died of cancer at 81 August 24, 2007, at his home in Somerton, Arizona.